Fits 7 inch inside diameter chimney. 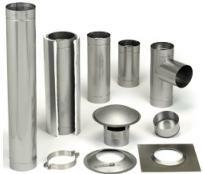 Rain Cap; Heat-Fab 316-SS 7"
48" Liner-4/cs; Heat-Fab 316-SS 7"
Adjust. Elbow; Heat-Fab 316-SS 7"
Tee; Rmvbl Take Off; Heat-Fab 316-SS 7"
Saf-T Wrap; case or 4; Heat-Fab 7"
Fits 7" diameter rigid pipe.